Steve J. O'Meara is a well renowned observer, author, coauthor, or editor of many astronomy books and observing columns in both "Astronomy" and "Sky and Telescope" magazines. Among his many accolades, the Texas Star Party (TSP) gave him its highest honor, the Lone Stargazer Award, "for setting the standard of excellence in visual observing." TSP also gave him its Omega Centauri Award for "advancing astronomy through observation, writing, and promotion, and for sharing his love of the sky". A series called "Deep Sky Companions:" which includes "The Messier Objects", "The Caldwell Objects", "Hidden Treasures", "The Secret Deep", and "Southern Gems*", is quite popular, owing to Stephen's observing prowess, style, and writing style. 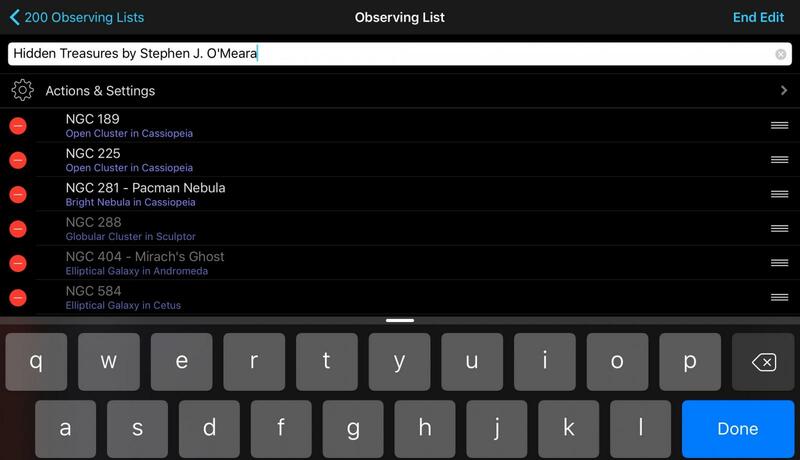 While the well known Messier objects and Caldwell objects are featured in Astronomical League Observing Programs making them popular amongst amateur observers and thus observing lists are readily available, published lists for "Hidden Treasures" and "The Secret Deep" are not as easily found. Why should this matter? In my opinion these two books represent a natural progression for any astronomer who has already observed Messier and Caldwell objects and is looking for another unique tour of the night sky. 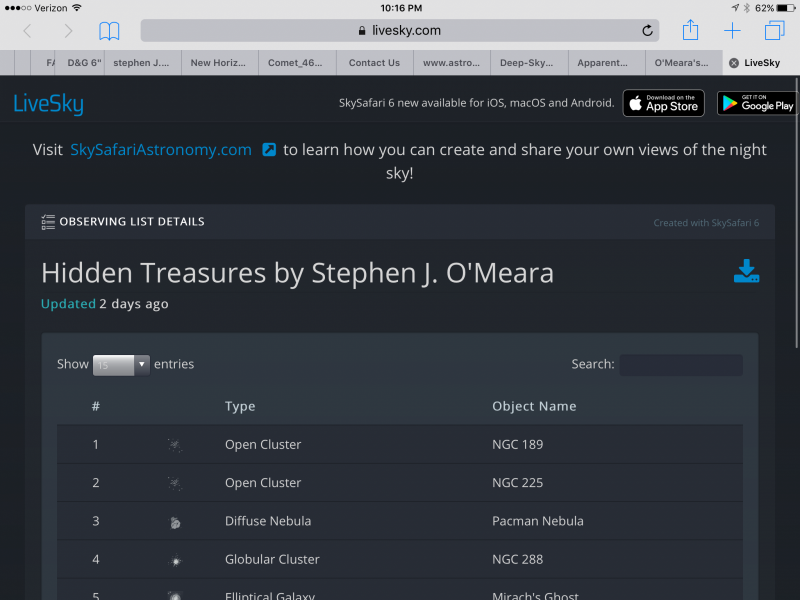 In "Hidden Treasures" Stephen has created an original list of 129 objects including galaxies, nebulae, star clusters, planetary nebulae, and other objects not found in the Messier or Caldwell observing lists. Another 130 original objects are covered in "The Secret Deep" All 259 objects are easily accessible to a modest aperture of four to five inches in reasonably dark skies. 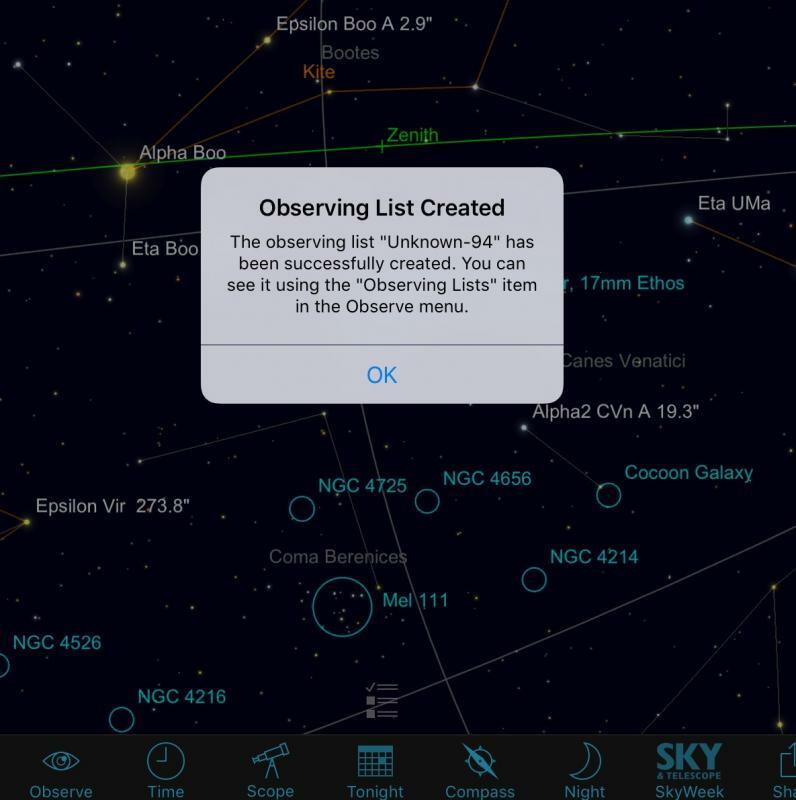 To supplement the material in these two excellent observing resources I have compiled the lists of objects covered in each book and made them available for download in .skylist file format for SkySafari Plus and Pro. There are 129 objects covered in the book "Hidden Treasures" including 20 additional Hidden Treasure objects listed in Appendix C.
There are 130 objects covered in the book "The Secret Deep" including 21 additional Secret Deep objects listed in Appendix B. *I have not yet acquired a copy of "Southern Gems". It is on my "wish list"! Edited by GaryJCarter, 16 December 2018 - 02:51 PM. "Hidden Treasures" is one of my most used references for DSO. I enjoy S.J. O'Meara's writing style and his sketches and photographs used in his books I find helpful. I own Hidden Treasures. One problem I have with it is Stephen O'Meara's choice to bestow nautical nicknames on a number of deep-sky objects merely to fit the theme of the book. I'm fine with DSO common names that are descriptive in some form but that isn't the case here. Stephen's writing style does make for an interesting read. I thoroughly enjoy it. As for the variety of names Stephen references in the book I did not recognize them either, however, experience tells me that really isn't that uncommon ... I have come across a variety of names assigned to objects, some of which were once exclaimed in the middle of a starfield at a starparty many years ago and the description stuck. No worries so long as the well known catalog reference is also given when such informal names are used. That stated, Stephen has taken liberties in both Hidden Treasures and The Secret Deep with references to "O'Meara 1" (OMe1) and "O'Meara 3" (OMe3) for astrisms he has chosen to name based descriptive notations made in his personal observing notes. SkySafari did not recognize these object names, ergo I was forced to use the RA and DEC given to locate one of the stars in those asterisms. Edited by brentknight, 18 December 2018 - 02:56 AM. Hi Gary, thanks for uploading the lists. I have livesky and Skysafari 6 pro also, do you know a way I can download the lists you made? Edited by brentknight, 18 December 2018 - 02:52 PM. On your iPad, you click on the URL provided above. LiveSky should open in the iOS Safari browser...you should see the following webpage (below). Next, click on the blue "Download" icon to the right of the observing list name. A "Choose Format" dialog box appears. 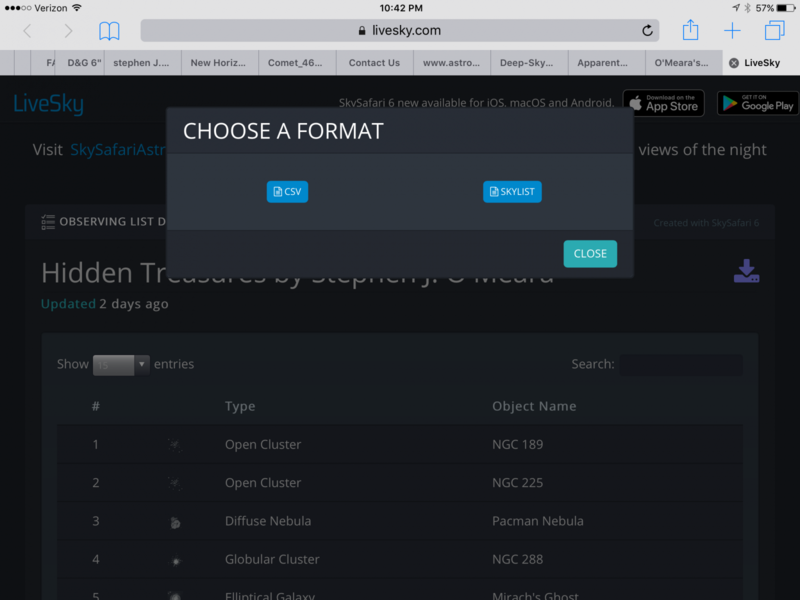 Select "skylist" format and it should open an "Open in?" dialog. Select SkySafari 6. 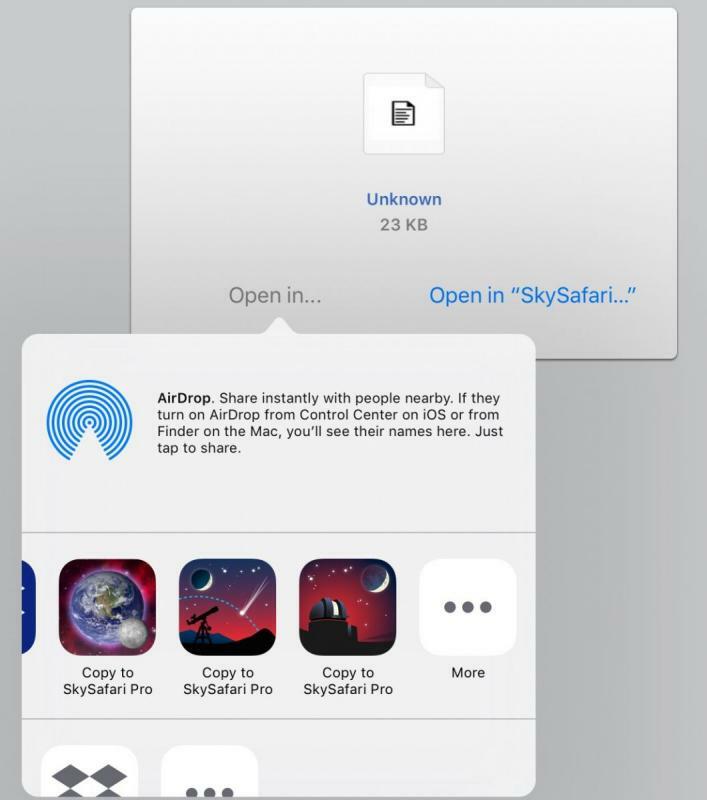 This will sync the list to your device, and assuming you used SkySafari 6, it will sync to your LiveSky account as well. Edited by GaryJCarter, 19 December 2018 - 12:06 AM. Edited by GaryJCarter, 18 December 2018 - 11:45 PM. Edited by GaryJCarter, 18 December 2018 - 11:51 PM.  Scroll down to the last list to find "Unknown - ##"
Edited by GaryJCarter, 19 December 2018 - 12:09 AM. Well explained, thanks! I was beginning to wonder what the use of my livesky account would be. Pretty cool stuff, thanks for sharing. Edited by Procyon, 19 December 2018 - 12:09 AM. LiveSky adds a lot of capability and flexibility to SkySafari. Some functionality is great, some...well...not so much. For me it has been a love-hate relationship as I have embraced it over the past year. Edited by GaryJCarter, 19 December 2018 - 12:20 AM. An amazing thing about O'meara's books versus current astronomy publications is they utterly ignore his methods drafting up laundry list check off articles. O'meara in his Messier book for example totalled approximately SIX HOURS per single object. He sets up and OBSERVES. After reading his books I now too observe with much longer attention per object and it pays off. They really great books but the essential thrust of it seems to be lost on much folks. In this respect the endless Starhop articles via sky and tel and astronomy have really damaged astronomy in so far as its taught observers how to gloss over details and move on to the next object. Sad really. Edited by azure1961p, 23 December 2018 - 09:36 AM. I really don't think the S&T starhopping articles (at least not most of them) can be blamed for this. Many of them emphasized exactly that you need to sit down and really study the object for more than a few minutes to see the most details, or, in some cases, the object at all. I think the issue is much deeper rooted, namely in the "instant gratification" culture that seem to pervade our society today. It runs so deep that it can unconsciously affect us, even if we try to actively fight against it. The best way to fight against it in visual deep-sky observing is probably to sketch what you see. +1. Excellent work - I’m already looking forward to getting out again! I am glad to have spurred your next observing sessions. Let us know how it goes! I think my post may have been a little draconian. Its not that they were a bad thing. Indeed, when Alan MacRobert did them it was my fav read. I took the mag to the telescope! Too, Theres a wealth of benefit and reward for those who rack up these untold tallys of deepsky object. My point is: but theres also ANOTHER way and for my money it got short shrift. I get it on a real level, these mags are looking to engage an audience, a general audience. Just wish theydve be more diverse. Cant say Ive ever found anything in that mag so compelling as a chapter out of one of Omearas books. I’ll let you know... here in Wisconsin, it may be awhile until weather and conditions allow observing. But these are the things that keep us looking forward to better times ahead.